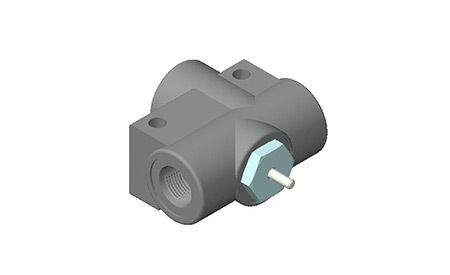 The Cross Model DCV valve is a frame mounted hydraulic depth control valve designed to control two cylinders operating on a common torque tube (rocker shaft). An actuator arm, mounted on the rocker shaft, will depress the DCV valve stem at a pre-set rockershaft position, stopping the cylinder and controlling tillage depth. The valve can be mounted on the most easily accessible location on the implement. Depth control cartridge features an 0-ring and back-ups on static seals and a urethane U-cup seal on the valve stem to give positive zero leakage and extended valve life. Internal passages of the DCV valve connect the base of both cylinders. This prevents any torsional wind-up of the torque tube. Unequal settings of individual depth stop cylinders, a break in the line to a cylinder or a leak in one cylinder would normally result in the implement load being carried by one cylinder and torque tube. With the DCV valve, any leakage or breakage results in both cylinders moving in unison.